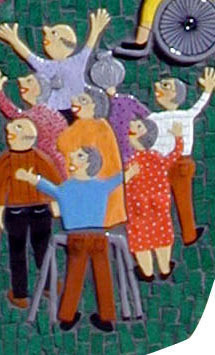 The 1901 wall depict 9 separate stories and the 2001 wall tells another 8 stories of both ordinary and famous people who have connections with our district. 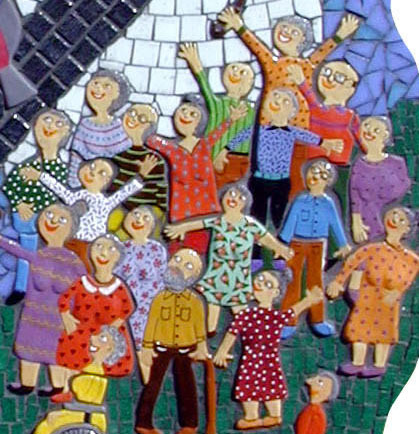 Their tales are told in pictures and words with my hand-made ceramic tiles surrounded by mosaic and the words which has been etched on aluminium plaque. As the Australian Government announced recently that they are going to pay employers a bonus for hiring and retaining older workers I thought this artwork of Mrs. Clare Bowers was topical for my blog this week. (More on Clare later). The plan is to pay a $1000 bonus to employers that recruit workers aged 50 years or over for more than three months and the government are also extending programs that provide support to employers who promote older workers and will put more funds toward career advice services and also education for mature workers. I am one of these people that think that age is just a state of mind and the thought that there is that age discrimination in the workplace is just ridiculous. A good mix of young and old and people from all different cultures and ways of life is the key. You need young people who can look at a task or problem with fresh eyes and ideas and also the older person with life experience and some mileage under their belt to provide a balance in most work areas. That said my first occupation as a Fashion Model was a very youth oriented profession, although I have looked on with amusement as there has been quite a movement there too into the older woman who still looks great. To me it does make a lot of sense to have the clothes that are aimed at the more mature bracket modelled by the women that are actually going to wear them. From my observation it all started by Lauren Hutton being retained by Revlon during the 80’s and 90’s and then followed by the likes of Elle MacPherson, Christie Brinkley and Jerry Hall. In the last couple of years the Couger trend has really caught on and the oldest model rumoured to be hitting the catwalk is Carmen Dell’Orefice who at 79 still looks fantastic (with a little help I presume). Mia Freedman from Mama Mia said recently “ As far as I can tell, there are only two ages for female celebrities: Dame Judi Dench and 30. At Dame Judi’s end, it’s pretty lonely. Just her and Betty White. At the other end, it’s gridlock with everyone from Courtney Cox, 47, to Lindsay Lohan, 26, visually colliding at the age of 30. Mia does have a point and she is not suggesting that we stop dying our hair, fight wrinkles and go without makeup but she does go on to say that there is a time when you go from looking amazing for your age to looking a little weird and then seriously weird, lol. These days the designers in New York and Paris are getting on the band wagon and hiring the older birds, much to the audiences delight who laughed, clapped and chatted throughout the shows which is not always the norm at these events. Madonna had the last laugh though as her album has shot up the hits list and went straight to number one. MDNA is Madonnas 12th album to top the chart, beating Elvis Presley’s record which stands at 11. So obviously she still resonates with both the young and the older demographic. Demi Moores story on the other hand has been a little sad as we have watched her desperate attempt to keep up with her daughter and her young friends through a haze of alcohol and drugs after her very public breakup from her much younger man. I would be the last person to cast a stone her way as I still love to party – if there is music playing I will still dance till the sun comes up and partake in a drink or two. 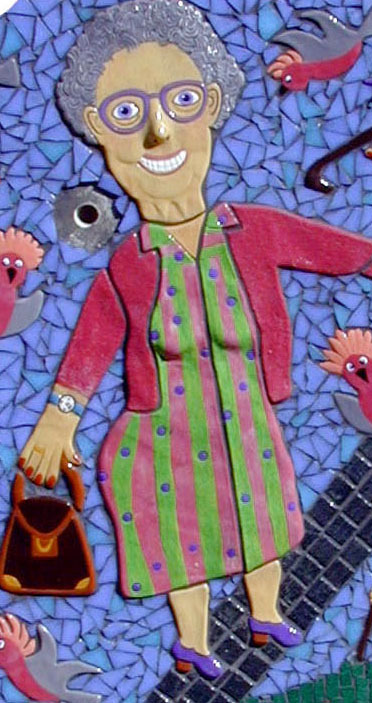 Chili Davis quote “Growing old is mandatory; growing up is optional”, which brings me back to this Centenary of Federation Sculpture and Clare Bowers. 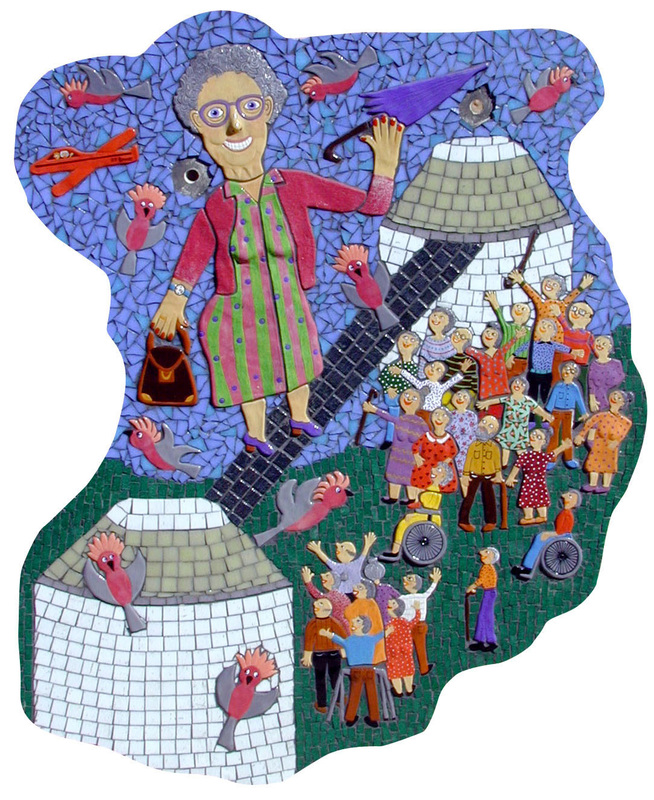 When Clare was eighty years old she was most interested to see the silos being built in her home town of Balaklava. So on one of her shopping trips she asked one of the builders if it was possible to go to the top of the silo. The arrangements were made and at 5pm on the allotted day the residents to the local old folks home where Clare lived, were ushered outside to a prime viewing spot on the footpath. They were all very surprised to see Clare hoisted to the top of the silo in a safety cage. Clare certainly had a zest for life and at the age of eighty-seven she again soared to great heights, this time as the eldest passenger of the Balaklava Gliding Club. “None are so old as those who have outlived enthusiasm”.